Ernie Els doing an interview on the telly and he reckons he's never seen a wetter course. The South African all but said he wants the final round to be played on Monday. 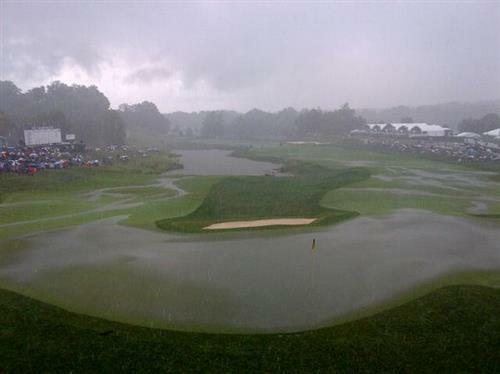 Greenside at 18 & we just survived a deluge at #Valhalla! SO. MUCH. WATER. 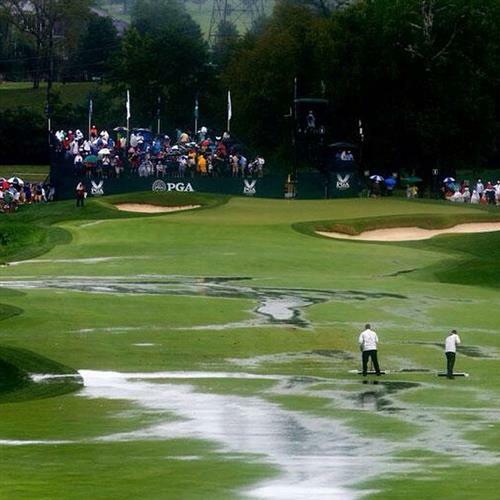 #PGAChamp Valhalla GC maintenance crews currently on the course to return the course to being playable after heavy rains a short while ago. I suppose the downpour has at least made life easier for the headline writers. 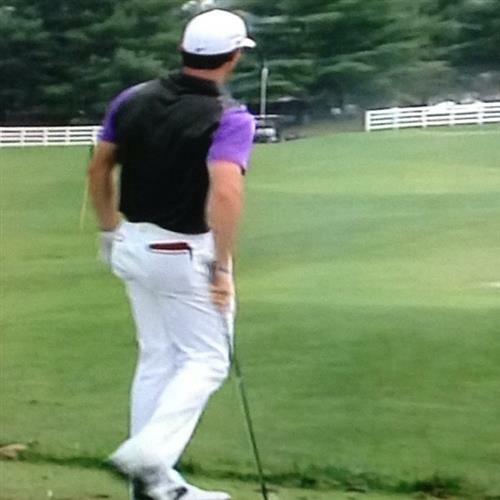 'Rory reigns at Valhalla' anyone? No? Suit yourselves then. Aha! The US PGA have spoken. Play will resume at 7.40 BST! I'm assuming they will be playing tomorrow at valhalla? The big question is whether the remaining groups will be able to play quickly enough to get this thing done. Time is of the essence but it's now not a golf course that is going to lend itself to rapid rounds. And yes folks, play has resumed! 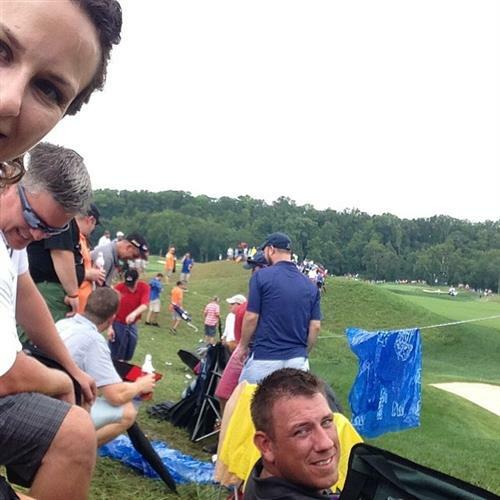 @McIlroyRory Good luck for the final round at Valhalla! :-) Must be difficult with the weather conditions, but confident of you winning!! Colin Montgomerie bogeys the 18th to finish five over for the tournament. Judging by his putting, the greens are significantly slower than they were two hours ago. Kenny Perry birdies the 7th. That's his second of the day and a good way to celebrate his 54th birthday so far. Scotland's Marc Warren is up and running, making a birdie on the par four 1st and he goes to six under for the Championship. It's not crazy to think they could finish today at Valhalla. Louisville being on the far western edge of the Eastern time zone will help. Big early move from Alexander Levy as the Frenchman birdies the 1st, 3rd and then the 4th to move to eight under for the tournament. 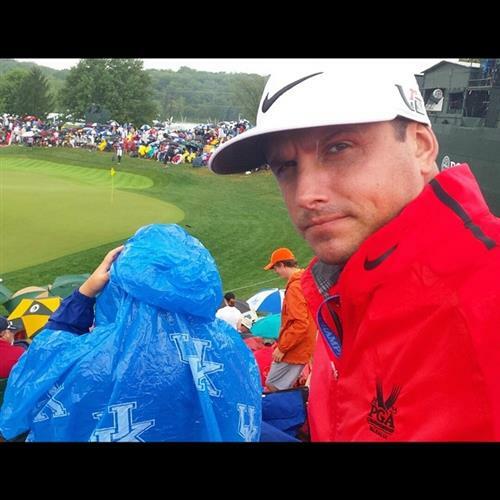 So Jason Day's going to get around Valhalla in under four hours, you must be joking unless he's got a buggy. Jimmy Walker picks up birds at the 3rd and repeats the trick on the 4th and he's now seven under. Birdie for Joost Luiten on the 1st and the Dutchman finds himself eight under. No-one has yet made a real charge up the leader board but with the number of birdies flying in, it won't be long before someone goes 10 under or better. 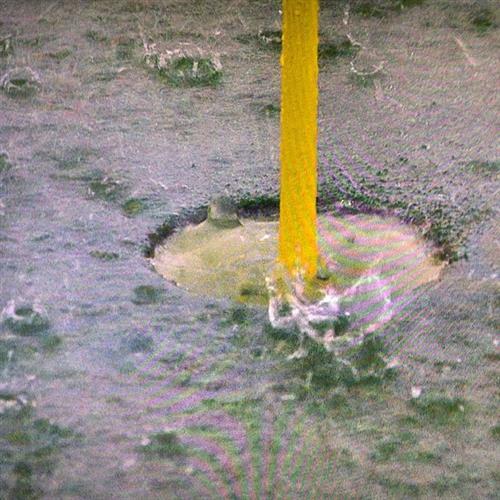 Speaking of birdies, Ernie Els makes his third of the day on the par four 5th and for a man who thought it was too wet to play, the seems to be rather enjoying the damp conditions at Valhalla. The South African is eight under. If you'll excuse the pun but it's, ahem, raining birdies now. Lee Westwood is the latest man to help himself, picking up a shot on the 1st. The Big Easy, aka Ernie Els, is tearing Valhalla to shreds at the moment. He lands a 15-footer on the 6th for a fourth consecutive birdie and suddenly the South African is nine under, a mere four shots adrift of McIlroy.